From the "It-could-happen-to-you" file: We innocently clicked on a link which was promoted today on a trustworthy company's Facebook page. To our surprise, avast! blocked it as a malicious URL. 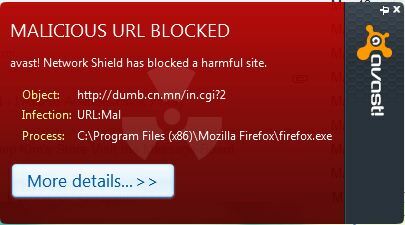 When we attempted to open the URL, it was redirected to dumb.cn.mn which triggered the blocking action. The only content on dumb.cn.mm is one word – GOTCHA! He went on to explain, "We receive only one word: GOTCHA. It's probably because the attackers running on dumb site's database with visiting IP addresses, and if they found this IP, only GOTCHA is returned. I think it helps them to be more secure from malware analysts and users looking into how they have been infected."